Although my oldest is only 5, he has somehow managed to create quite the social life for himself. Between classmates at school, the kids in the neighborhood, and his peers from his extra curricular activities such as karate and swim class, he has gained a mini network of friends with whom we do our best to help him stay connected with. While he does enjoy a steady flow of healthy, social interaction, an unforeseen consequence of this is he tends to get invited to quite a few birthday parties. To my 5 year old, this is an awesome way to live your life, since he gets to eat cake and play games to his heart’s content. For parents however, it not as enjoyable for us as it is for them. The burden of finding the right gift that is both tasteful, yet not too expensive falls squarely on our shoulders. Our already busy, exhausted shoulders. On top of that, since we’re crazy enough to actually attempt to keep up with all of these birthdays, the number of gifts that we end up buying over the year can get pretty expensive. My frustrations were soon alleviated during a fateful trip to Walmart. 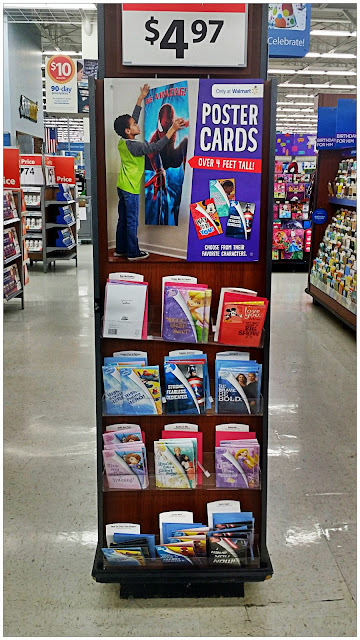 I was searching for a card for yet another birthday party, when I came across an intricate display for Hallmark PosterCards for Kids. At the Hallmark display, there was a wide array of cards that share positive, encouraging messages meant to uplift and child’s spirts high. The characters ranged from The Avengers, to Mikey Mouse, to even Tinkerbell. What sets Hallmark Poster Cards apart of the average, run of the mill birthday card is the surprise inside. 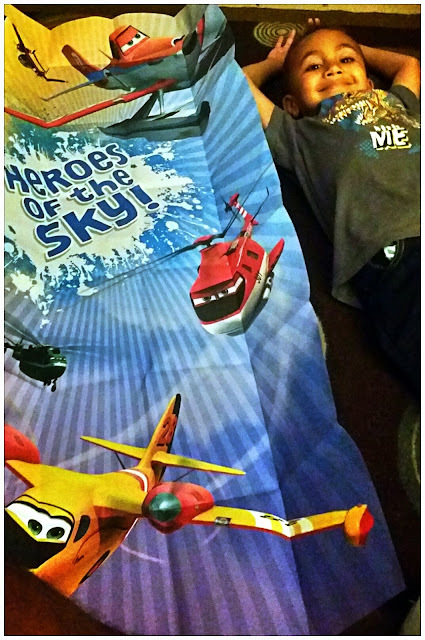 Each card can be unfolded into an awesome poster that is over 4 feet tall! It’s a card and the gift in one fell swoop. It’s pretty ingenious if you ask me. I grabbed a few Hallmark Poster Cards because I knew that there were a couple of birthdays coming up this fall. 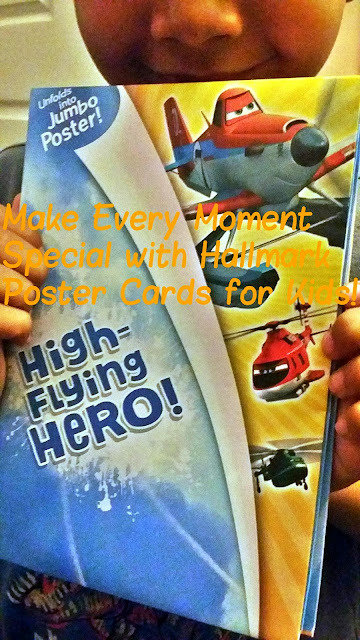 And although his birthday already passed a couple of months ago, I decided to grab an extra special Planes Poster Card for my 5 year old because I know how much he loves Dusty Crophopper. When I handed him his card, his reaction was that of slight confusion to sheer elation. It was priceless. Well, it was actually $4.97 plus tax, but you get the picture. To take advantage of even bigger savings, check you the Hallmark Card Rewards Program. 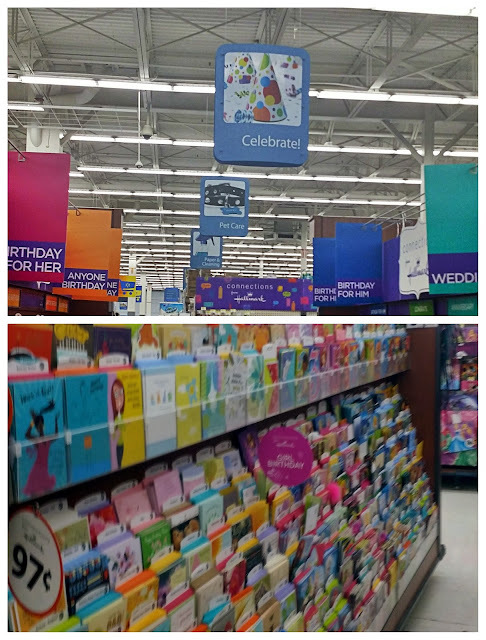 For every 4 cards that you buy at Walmart, you earn a reward!